What makes our tours outstanding? Our tours are personal and privately narrated with no more than seven of your family members or close friends! (They`re not just another boat ride down the middle of the river with a bunch of strangers!) All of our Captains grew up on the local marshes and wetlands and will take you on a TOUR of Florida`s real outback. We stop along your TOUR to tell you about the history of the river, the Florida alligators life cycle, their mating rituals, how we hunt them, the different birds on the marsh and to take pictures of the wildlife and of your group with a swampy background! We do the cheapest 30 minute "boat rides" on the Spacecoast but our specialty is small personal and privately narrated TOURS catered to your specific desires from one to four hours. We provide hearing protection, water, and a camera (in case you forget yours). Is there a guarantee we'll see alligators? Since our tours are in the wild (not an alligator farm) we cannot guarantee you that you will see alligators during your airboat tour but we can guarantee you that we will make every effort possible to show you alligators. 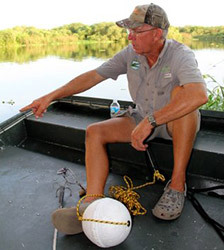 Our Airboat captains have many years of experience and normally know where to go to find them, but since alligators roam the wild each tour is unpredictable and unique. Since alligators are cold blooded reptiles they are very temperature sensitive so there are certain months and days that we see more than others. If your only goal is to see an alligator ask before booking and we'll be glad to tell you what their recent activity has been. When is the best time of year to take an Airboat Tour? 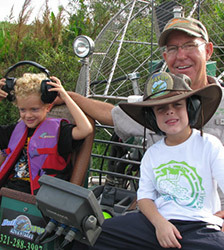 Anytime of the year is a great time to take an airboat tour in Central Florida! The Spring is incredible with all of the trees and plants blooming (adding vibrant colors to the already phenomenal landscape) and the alligators sounding off and displaying their mating rituals. Summertime is warm and humid which brings the alligators out early in the morning and late in the evening along with the Great Blue Herring and the beautiful White Egrets. Fall is spectacular with very pleasant weather with cool mornings and evenings and an abundance of animals and beautiful foliage. Florida`s mild winters are a great time of year as well bringing out the fur-bearing (fuzzy) animals, like deer, otters and the migratory birds. Being cold blooded, the alligators stay in the water on the bottom as long as the water is warmer than the air but as soon as the sun comes up and the air temperature gets warmer than the water temperature they begin to crawl out on the banks to warm their bodies. This is the best time of the year to get up close for some great pictures of the gators on the bank as they are somewhat lathargic. The mornings and evenings can be a bit chilly so midday tours are a bit more comfortable and the gators are up on the banks warming up! No, not really. Normally, at dawn, the mosquitos find a place to hide in the foliage and they stay there until dusk. As long as the airboat motor is running the propeller moves enough air to keep them at bay. However, it is recommended that you take precautionary measures by applying mosquito repellent as necessary. How old do you have to be to ride on the tours? All ages are welcome on our tours! (However, we don't recommend that you bring infants unless your group rents the whole boat as we cannot turn around and come back if the child becomes unhappy.) Captain Mike really enjoys having the children and taking pictures of them in the drivers seat with his cap! Seniors also enjoy our tours as the boat is easy to board, very stable and dry. We do a lot of "bucket list" tours! You might get an occassional light spray. Sunscreen, sunglasses, a hat or cap if you desire, bottled water, camera, a light jacket or windbreaker it the temperature is below 75 degrees. On our Lake Washington tours we usually tour to the north end of the lake (where we often see gators lounging on the surface or on the east bank of the lake) and through the reeds in the airboat trail on the north end of the lake. We often stop a time or two to share with you the kind of plants or trees that you see and what the alligators are doing. As we work our way to the northwest corner of the lake into the river itself we often see gators cruising in the river or jumping off the banks. Depending on water levels and the size of the boat we're in at the time we may go over the weir and up the river a mile or two before heading back south down the river around the west side of the lake and back to the landing. Our Three Forks Conservation tour is a totally different experience than our Lake Washington tour. We travel south through the the incredibly unique eco system as we slide across the acres fo lily pads and weave between the submerged trees and stumps of what was once a cow pasture before it was diked in to make it a reservoir. The Florida Wildlife Commission in conjuncion with the Saint Johns River Water Management Distrct has worked tirelessly for over ten years to make this a future fishing mecca until they ran into legal issues with the Semnole Indian Tribe of Florida and the Miccosukee Indian.s This is a real swamp boat ride experience but we don't usually see as many alligators because of the expansive swamp environment with so many places to hide. 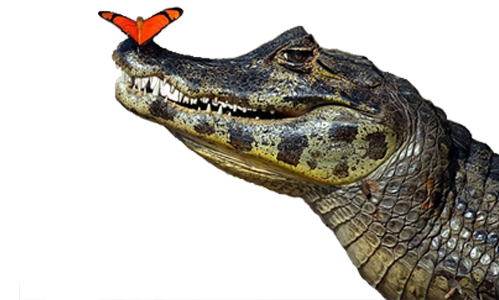 We stop along your tour to share pictures and information with you regarding: the mating rituals and life cycle of alligators; different kinds of birds, wildlife, plants and fish. 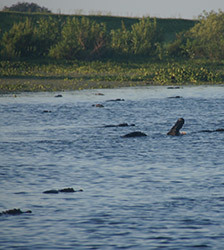 On our 90 minute tours we demonstrate the equipment and techniques used in hunting alligators if the group disires. We also stop several times during your tour to take pictures of your group from inside and outside the boat!